Described by Simon Jenkins in 1000 Best Houses as the most perfect house to survive from the middle ages. Set in the heart of the beautiful Peak District National Park, parts of the house date from the 12th century, sitting like a jewel in its Elizabethan terraced gardens and overlooking the River wye. 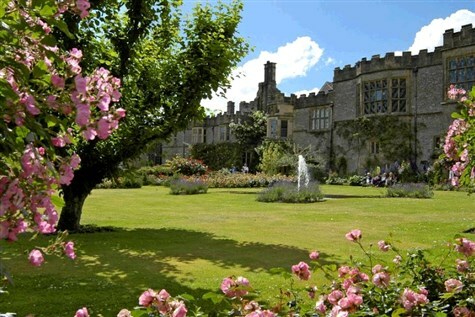 Film makers flock to Haddon Hall to use it as allocation and screen credits include Jane Eyre, Elizabeth, Pride and Prejudice, The Other Boleyn Girl and The Princess Bride. There is a fine example of a medieval kitchen, and an Elizabethan Long Gallery and the exterior is adorned with climbing roses and there is a beautiful terraced garden. We also embrace some of the beautiful Peak District National Park.